In the first of a series of podcast interviews, National Academy of Social Insurance CEO William Arnone interviews Founding Member Nancy Altman about the early days of the Academy. Altman is co-director of Social Security Works and author of The Battle for Social Security: From FDR’s Vision to Bush’s Gamble (John Wiley & Sons, 2005). Listen now. What does the outcome of last Tuesday’s election mean for the future of social insurance in the United States? Although the core elements of our nation’s social insurance structure – Social Security, Medicare, Workers’ Compensation, and Unemployment Insurance – were given little attention during the debates, a new Administration and Congress will no doubt take a hard look at the strengths, weaknesses, threats, and opportunities confronting these essential programs. Vital protections provided by other key programs within the scope of the National Academy of Social Insurance – such as Medicaid, Supplemental Security Income, and especially the Affordable Care Act – are facing serious challenges. In the United States, poverty rates for seniors increase at older ages. The rates are higher for persons age 75 and older than for persons age 65 to 74. Poverty rates increase at older ages because relatively more people fall into poverty as they age than exit poverty due to death. Persons who live longer may fall into poverty because of various life events -- their spouse dies, they have higher medical or long-term care expenses than expected, or their investment returns are worse than projected. As Americans live longer, they face an increased risk of outliving their savings. In recent decades, women have entered the work force in droves, making substantial contributions to families’ financial stability. As a result, however, the once common figure of a stay-at-home caregiver is rapidly diminishing, and families are left to fill in the gaps. Despite increasing responsibilities outside the home, women still also shoulder the primary responsibility of both caregiving for children and for ill or aging adult family members. Increasing pressure to make ends meet with less time and stagnant wages is taking both a financial and emotional toll on working families. Why Does the United States Lack a Comprehensive Social Insurance System? In a recent issue of the Boston Review, Elizabeth Anderson, Professor of Philosophy and Women’s Studies at the University of Michigan, wrote a provocative analysis ("Common Property: How Social Insurance Became Confused with Socialism", 7-25-16) of the origins and evolution of social insurance worldwide and in the United States. Her article includes key points that are critical to an understanding of the positioning of social insurance in our economic and political system, and in our culture. She poses a fundamental question: Why does the U.S. lack a comprehensive, universal social insurance system? 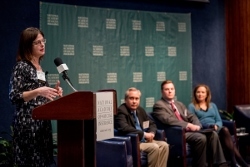 As part of the Academy’s continued focus on income and wealth inequality, expert panelists convened at the National Press Club on June 21st for Advancing Equity and Inclusion through Social Insurance, three discussions that explored how public policies can bolster American family stability in an evolving economy. Recognizing how economic opportunity and mobility are affected by entrepreneurship, paid time away from work for caregivers, and the entrenched wealth divide between whites and people of color, panelists affirmed that social insurance programs provide a critical safety net for risk-taking, retirement planning, and family caregiving. This piece was originally published on the Health Affairs Blog on April 20, 2016. The Academy, which has a long tradition of exploring policy solutions to the challenges of long-term care, devoted a session at its January policy research conference to the financing of long-term services and supports. President Obama’s final Budget, released last week, included proposals for reforms to the federal-state unemployment insurance (UI) system. These budget proposals in part elaborate on remarks in his final State of the Union last month concerning supports for the U.S. workforce. The speech hinted at greater access to training programs by UI claimants and a full-scale wage-insurance program. The Administration’s Budget offers detailed proposals based on those remarks in addition to other UI-related improvements. A blizzard dropping nearly 28 inches of snow did not stop hundreds of social insurance experts from participating in the Academy’s 28th annual policy research conference last week, Disparate Income, Wealth, and Opportunity: Implications for Social Insurance. Co-chaired by Kilolo Kijakazi of the Urban Institute, Maya MacGuineas of the Committee for a Responsible Federal Budget, and David Colby, the two-day conference – built upon two Fall convenings on the same topic – ushered in the Academy’s new strategic focus on income and wealth inequality. Participants, including new and veteran Academy members, came together to share views from both sides of the aisle on income, wealth, gender, and racial/ethnic disparities and how social insurance and other public policies can play a role in mitigating them in fiscally sustainable ways.